Below you will find a map of the many local conservation clubs who enjoy membership of Michigan United Conservation Clubs. 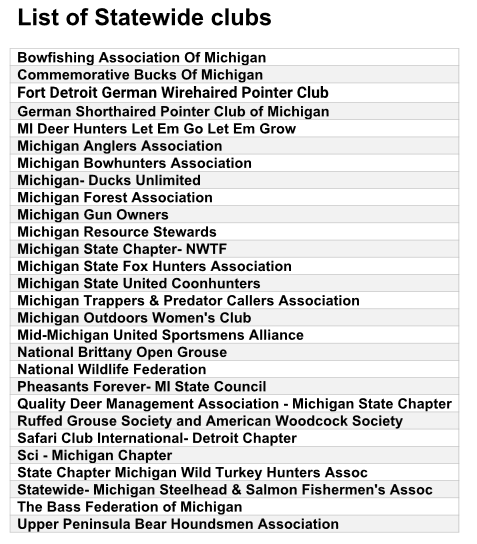 Membership in Michigan United Conservation Clubs shows your commitment to conservation. Your dues support our programs to advocate for the rights to hunt, fish and trap; to communicate about the critical issues you need to know about as a hunter, angler, trapper or conservationist; to conserve and enhance fish and wildlife habitat; and to educate the next generation of conservationists. If your club information is incorrect, fill out our club update form here.